You see all these television adverts with companies advertising their products, and their deals, and you hear them talk and rave about their products, you also hear them state some things that leave your mind baffled (well at least my mind!). For example, there's an advert floating around at the moment, saying if your bed is over eight years old, why not replace it!? Eight years!? Is that the expected life span for a bed? If so, I'm seriously going wrong somewhere! It's not even been four years (basing this on half the bed life expectancy span!) since my bed got replaced, it was in fact 14 months ago and it needs replacing already! The bed that was suppose to come with me to the house, decided it was going to break on me whilst getting dismantled for transport! You know, like I didn't have enough to spend out on the move, things wanted to break on me also (Spud's tent to his bed got ripped in transport and needed to be binned, ahh!). I don't think we need to see adverts to determine which bed we need, I'm a mum, I'm a parent, so here's my guide, the parents guide on picking a new bed! Step One: Make Sure Your Bed Is Selfie Ready! When you're a parent, you know your selfie spots, it's not as simple as taking a selfie wherever you like! If you want to take a picture in the kitchen, no doubt you'll find washing up lurking behind you in the sink, in the bathroom one of the children have got their bath toys everywhere, whilst another has pulled on the toilet roll leaving a trail, and the front room looks like a dump, so don't even think about it! Make sure your bed is compatible with you taking selfies on! You can't allow a bed to outshine your face! You want people to think your face is pretty, not your bed! Step Two: Ask Your Mini Me for Their Opinion! 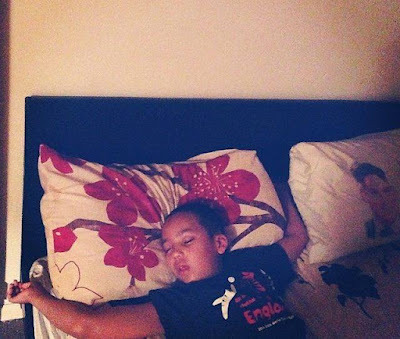 At some point, or even every night, your child/children are going to be sleeping in your bed! Maybe they was like Spud when he was younger, we co-slept, and so he was in my bed every single night, or maybe they want comforting snuggles when they're poorly. 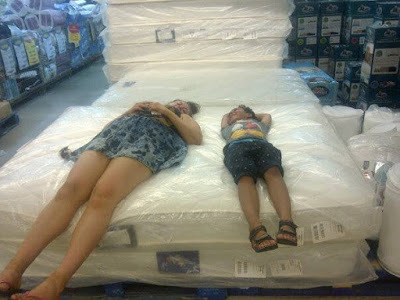 Either way, your mini me's opinions are much needed, children jump and bounce on beds, get them to do this on a display bed and test out the beds pressure! Step Three: Be Wise: Browse In Store, Buy Online! Visit them bed stores with every intention of buying a bed right there on that day, tell the sales reps you're buying a new bed and have a good look around! Take pictures to note down names and styles you like and be extra friendly to staff! They won't mind when you leave the store empty handed because you've told them you'll visit again with your partner (even if one doesn't exist!). Go home, do a search for the style of bed you like, for example style of bed you like and save money by shopping online! Step Four: Re-decorate Before The Bed Arrives! Don't do what I done when I was 21, I thought I could make a big decision like painting my furniture white to match my new bed. How stupid was I!? I got white gloss on my off white bed and it ended up looking like a ghost with white spots, or a dalmation with off white spots, you get the drift, don't paint after your bed arrives! Don't even drink tea or coffee when your new bed arrives, we know they like decorating items, so just play it safe, skip breakfast in bed, and paint when the bed is still at the warehouse/store! Step Five: Make Sure Your Favourite Celebrity Is Around! 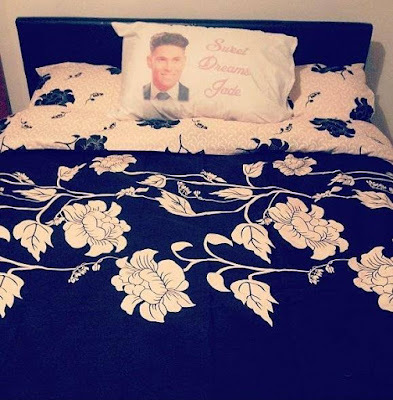 A perfect sleep doesn't exist if you don't have your favourite celebrity in your bed at night! My gorgeous nephews treated me to a pillow case of one of myy favourite celebrities and now I get a perfect sleep every night! Of course wen Gareth is around, Joey and his face gets ditched, because Gareth is more gorgeous than Joey obviously! There we have it, I hope you liked my guide, not an expert guide, but a parent's guide!